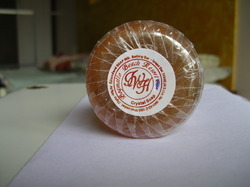 As a leading manufacturer, we are engaged in manufacturing the best quality of Brown Translucent Laundry Soap. We have used the best quality oils to manufacture the product, hence they result in stainless and spot less cloths. It is available in 150 gms individual Packing. The superb quality along with competitive prices makes us the prime washing soap manufacturer. 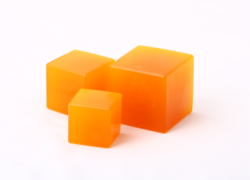 Translucent Soap Cubes are ideal for making translucent soaps without using soap machineries. These soap cubes can be heated in the stainless steel vessel at a certain degree were perfume can be added and it should be poured in soap trays when it cools down, soap bars can be cut, stamp & packed in various shapes & sizes. We are First Manufacturer, Exporter and Trader of Semii Transparent Laundry Soap in India. We are largest exporter of Translucent Laundry Soap in India. Laundry Soap is purely Vegetarian at very Competitive Price for International and Domestic Market.